We hear daily from members and citizens that our leadership is desperately needed to stop corporations’ attacks on our food, our water, and our climate. We’ve never shied away from that challenge, and with your help and the assistance of our organizational allies, we’ve won some big fights against formidable opponents. Even more importantly, we’ve developed winning strategies and the people power to continue waging these fights all over the country so that one day soon, humanity’s needs will be protected over corporate greed. We’re winning, and we intend to keep it that way. Support More Victories by Becoming a Contributing Member! Activists like actor Mark Ruffalo worked with us to avenge New Yorkers affected by fracking, leading to a statewide ban. In New York, the oil and gas industry was targeting the sedimentary formation called Marcellus Shale for fracking — so we made it our goal to stop them. Many said it was impossible, but we didn’t listen. Along with your support and years of organizing work with hundreds of groups in the New Yorkers Against Fracking coalition, in 2014 we finally banned fracking in New York. The mission continues — fracking pollutes our air and water and contributes to climate change. Our next goal is to ban fracking everywhere. Our advocacy for a ban on arsenic in animal feed in Maryland led to a federal ban in 2015. Would you eat chicken or turkey that had arsenic in it? Of course not, but for decades, arsenic-based drugs were given to poultry. People were then exposed to this arsenic that remained in the meat or ended up in the environment — an unacceptable risk to our health! After winning a ban on using arsenic in poultry feed in Maryland, we continued national efforts and won a federal ban on arsenic-based animal drugs in 2015. 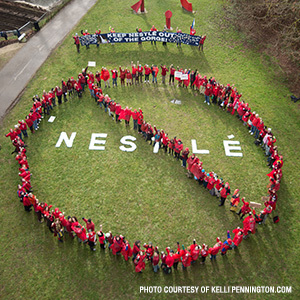 Corporate power may seem unstoppable, our campaign against Nestle’s water privatization projects show that together we can win. When big companies take water from local communities, it hurts both people and the environment. Standing firm in our belief that water is a basic human right (and should not be used for corporate profit), we worked with broad coalitions to stop Nestlé from taking water from communities in California, Oregon, Pennsylvania, and Washington. As a result, we’ve proved that people can take on the world’s most powerful food and beverage company, and WIN! Food & Water Action was a central player in the national fight to stop the Trans-Pacific Partnership. The Trans Pacific Partnership (TPP) is a global trade deal that would undermine laws that protect our food and water, and would promote more fracking. Despite the backing of Big Business and politicians from both parties, we helped stop this controversial trade deal alongside a mighty coalition of environmental, labor, health and community organizations. People like you helped power this fight to stop the United States from joining the Trans-Pacific Partnership. 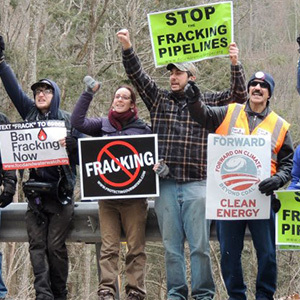 Food & Water Action was the first organization to call for a national ban on fracking. Over 600 communities later, we’ve proven that people everywhere are behind it. The oil and gas industry is doing everything in their power to frack across the U.S., causing drinking water contamination, air pollution, and serious health problems. But we won’t stand for this! Food & Water Watch released a report calling for a national ban on fracking, and became the first U.S. national organization to do so. Since then, the movement to ban fracking has grown exponentially, with more than 600 measures against fracking passed in communities across the country. Our campaign to stop Starbucks from using milk from cows given rGBH growth hormones led to industry-wide reform. Factory farms give dairy cows rGBH, an artificial growth hormone that causes serious health problems for cows. Its effects on people are still not fully understood. After two years of pressure from Food & Water Watch, Starbucks committed to making 100% of their milk supply rGBH-free. Once Starbucks switched to using only rGBH-free milk, more companies followed, and rGBH-free milk grew in the marketplace. 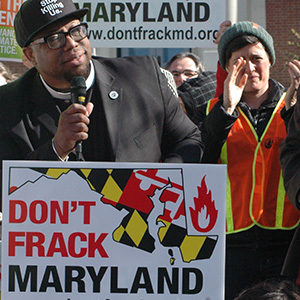 After five years of hard work, we secured a bipartisan agreement to ban fracking in Maryland. Hard work, dedication, and incredible people power made this huge victory possible —after five years of fighting, Maryland became the third state to ban fracking. Food & Water Watch and the Don’t Frack Maryland Coalition stood together and pushed for what we knew was necessary to protect Maryland’s air, water, health and climate. In April of 2017, Governor Larry Hogan signed the bipartisan bill to ban fracking in Maryland. Our organizers led the March for a Clean Energy Revolution outside the DNC in Philadelphia, July 2016. It was the largest anti-fracking action ever in the United States. 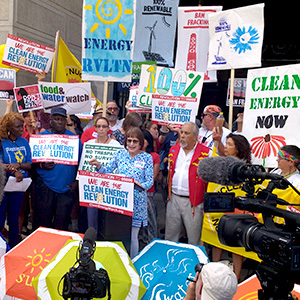 The March for a Clean Energy Revolution was the largest anti-fracking action in U.S.! On July 24, 2016, outside the Democratic National Convention in Philadelphia, over 10,000 people stood together to demand a sustainable future. The thousands of citizens gathered outside Independence Hall sent a powerful message: the Clean Energy Revolution has already started — and together, we’ll put the country on a path to 100% clean, renewable energy! We’ve helped stop water privatization in communities across the U.S.
Water privatization is nothing short of a giveaway to profiteering corporations. When communities hand control of their water systems over to private companies, rates skyrocket (on average by 59% more), service worsens, and workers lose jobs. We’ve fought water privatization since our founding, and working with local coalitions we’ve protected local control of water and sewer systems in dozens of communities. Oil and gas companies will build their pipelines through your backyard. We’ve shown that people power can stop them. Fossil fuels projects (especially ones connected to the rush to expand fracking) are poisoning our water, polluting our air, and threatening the climate on which we all depend. We need to move off fossil fuels now! Working with community partners across the country, we’ve stopped fracking and drilling projects, power plants, gas storage facilities, export facilities, and pipelines. We believe everyone is entitled to food they can trust, a planet that is livable, and safe water controlled by the public. Our mission continues, from pushing to get the OFF Fossil Fuels Act passed, to fighting back against Trump’s disastrous direction for the EPA, and much more. Join us. Become a contributing member and together, we will secure a safer path forward for all of us. Becoming a Contributing Member Today to Support More Victories Like These!